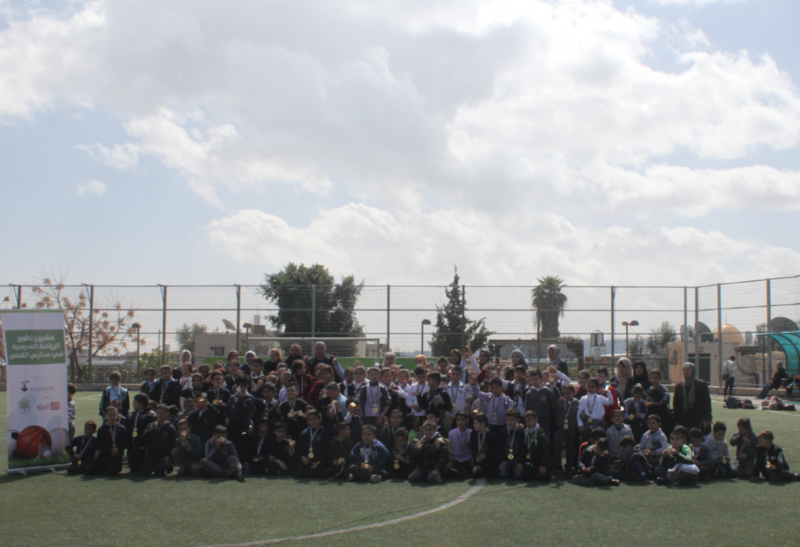 Burj Al-Luqluq Social Center Society organized tele-match activities for the students of the Jerusalem schools within the Development of Schools’ Sports projects with the participation of 130 male and female participants from the Old City schools and its surrounding, with the presence of the head of sports activities of the Ministry of Education, Jamal FArhoug, Ra’eda Arikat, Muta Suan and Burj Executive Manager, Muntaser Edkaidek. The tele-match activities were organized for the students from the 1st until the 4th grade from 6 different schools; Al-Hasan Al-Thani, Al-Duha, Al-Nahada B and C, Al-Aytam C and Al-Rawda Al-Haditha within the plan on the Ministry of Education, in partnership with Burj Al-Luqluq, to activate the children and their extracurricular activities. At the end of the activity the participants received medals as the activities remained for two hours under the supervision of Burj Al-Luqluq Sport Supervisor Alaa Jamjoum with the assistance of Marwan Saleem.